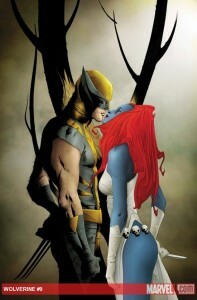 2 Comments on "Wolverine #9 Open Thread"
Despite the somewhat “cool” vibe, I absolutely despise this cover! Doesn’t Marvel let its artists know anything about the physical features of its characters? Isn’t Wolverine supposed to be 5′ 3″ tall? Isn’t Mystique supposed to be about 5′ 10″? Is Logan standing on a box? Is Mystique standing in a trench, or has she suddenly become a pygmy? Showing him as the typical taller, dominating male cheapens the art and makes the characters look mundane to me! Don’t these people know what they’re drawing?